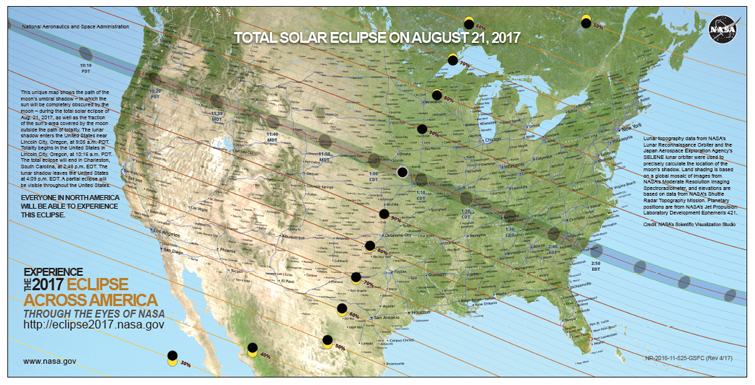 It's been all over the news for months - on August 21st a rare solar eclipse will occur that will be viewable by the entire continental United States. This is something that nobody should miss out on! We want to share some vital information about this amazing event. This map (nasa.gov) gives us the path of the moon and exactly how much of it's shadow will be seen from various parts of the nation . The moon's shadow enters the United States near Lincoln City, Oregon, at 9:05 a.m. PDT. The total eclipse will be visible along the path shown, ending in Charleston, South Carolina, at 2:48 p.m. EDT. The lunar shadow leaves the United States at 4:09 p.m. EDT. A partial eclipse will be visible throughout the continental United States. Looking directly at the sun can be very dangerous and damage the retinas, below is a chart of when it might be safest to view the eclipse and when to use an approved filter. How can I look at the eclipse while still protecting my eyes? Here is a list of a few vendors that are providing special sunglasses and viewers to safely enjoy the event. The only safe way to look directly at the un-eclipsed or partially eclipsed sun is through special-purpose solar filters, such as “eclipse glasses” or hand-held solar viewers. Homemade filters or ordinary sunglasses, even very dark ones, are not safe for looking at the sun; they transmit thousands of times too much sunlight. If you are inside the path of total eclipse (in Wisconsin we are not!) only remove the filter when the sun is 100% covered by the shadow and it becomes quite dark outside. Here in Wisconsin, there will be a small area of sun still exposed, so please be sure to keep the special filters on. Remember: not just any old sunglasses will do! If you wear glasses, do not take them off, just hold the filter in front of your prescription glasses. If you are thinking of using a camera or telescope to view the eclipse, note that you still need to have a special filter in place to protect your eyes while looking through the ocular or viewfinder! What if you have no special filter and still want to enjoy the solar eclipse? An alternative method for safe viewing is a pinhole projector. What do we mean by pinhole? Per nasa.gov "Cross the outstretched, slightly open fingers of one hand over the outstretched, slightly open fingers of the other, creating a waffle pattern. With your back to the sun, look at your hands’ shadow on the ground. The little spaces between your fingers will project a grid of small images on the ground, showing the sun as a crescent during the partial phases of the eclipse. Or just look at the shadow of a leafy tree during the partial eclipse; you'll see the ground dappled with crescent suns projected by the tiny spaces between the leaves." A solar eclipse is a rare and fantastic phenomenon that nobody should miss out on, but we must be careful to follow these safety instructions to protect ourselves. Keep your eyes safe and happy viewing!